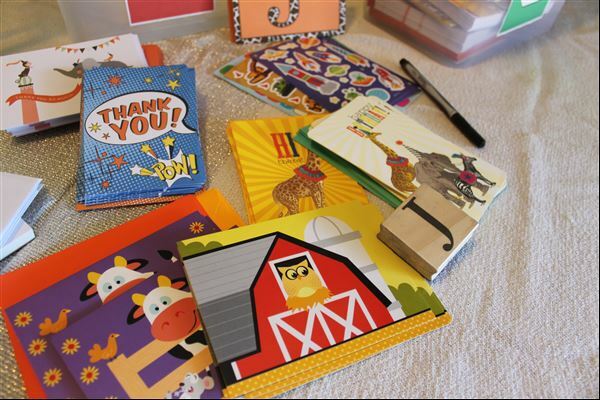 I love the idea of my boys being letter and card writers. It’s not easy in these instant, electronic days. I love giving and receiving snail mail, but I sure don’t make the time for it like I’d like to. I want to help to instill gratitude in the boys as well and not only gratitude, but expressing gratitude. So we work at writing thank you cards for things the boys receive – it takes us a while sometimes, but we get there eventually. I also like them to send things to their relatives overseas and in other cities. Like I said, it’s not always easy to make the time, but I figure let’s make it as easy as possible when inspiration strikes and when it’s time for a thank you. 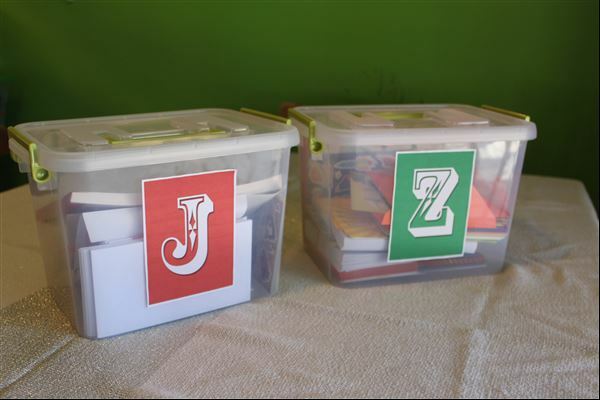 So I came up with the idea of a Correspondence Kit for each boy. I purchased a small plastic container with a handle for each of them. I printed out their initials on label paper and added it to the outside. To stock the kits, I’ve kept a look out for monogram stationery that suited them, along with monogram stamps. 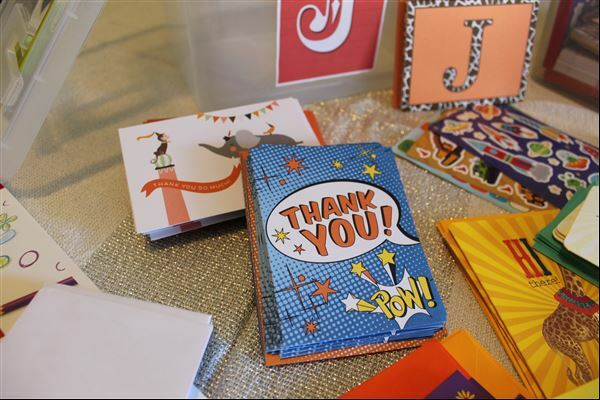 I included writing paper, envelopes, blank notecards and, of course, plenty of thank you cards. I added a pen and some stickers. 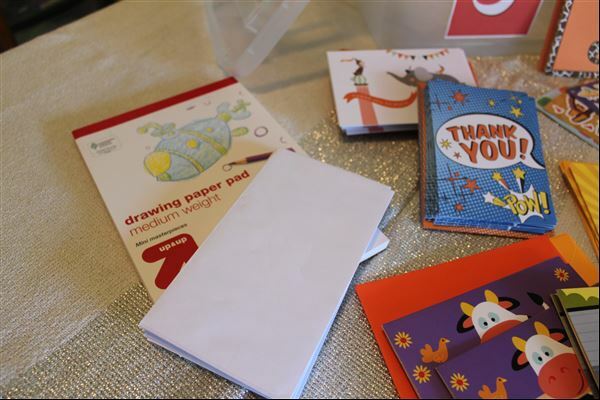 We have lots of art and craft supplies available to add to the mix as the boys get inspired. I had a lot of fun with this super simple project and I’m inspired to make one for myself. 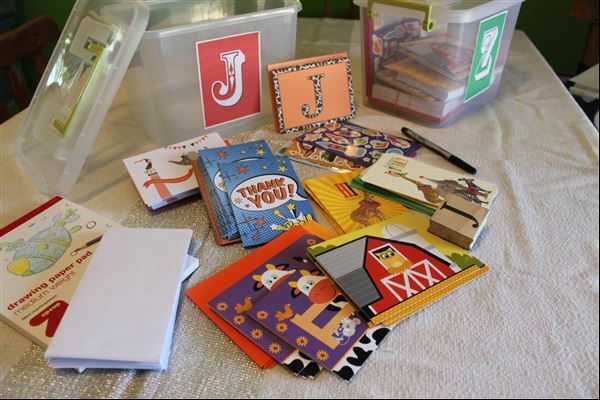 I have heaps of notecards and writing supplies, but I want to get them all together in one simple kit so that I, too, can correspond at the drop of a hat! I’ll be sure to post photos when I get my kit together! Categories: Crafting, Creativity, Family, Life & Times, Make It Monday | Tags: correspondence, gratitude, thank yous | Permalink.